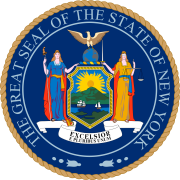 The 1963 New York state election was held on November 5, 1963, to elect a judge of the New York Court of Appeals. Besides, an amendment to the State Constitution proposed to allow off-track betting and was accepted. Judge Sydney F. Foster would reach the constitutional age limit of 70 years at the end of the year. Both Democratic and the Republican state committees met on September 9, and nominated Democrat Francis Bergan, the Presiding Justice of the Appellate Division (Third Dept. ), to succeed Foster.